This giveaway has ended. Stay tuned for the next one! WIOG is back! We're relaunching the WIOG feature as tasting notes on individual wines. Instead of reserving WIOG for special occasions like festivals, trail visits, etc., when we're tasting a bunch of wines at once, we've decided to include notes on our everyday Michigan wine consumption so we can get you the scoop faster and more frequently! Since we drink a LOT of Michigan wine (you may have noticed), WIOG is our attempt to give you an idea of some selections you may be interested in checking out based on what we've been experiencing. Cheers! Day 8 is closed as of 11.59 p.m. April 8. Stay tuned for the next giveaway! 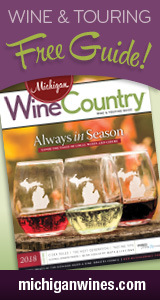 It’s finally here: Michigan Wine Month! And with it, the MBTB SUPER HUGE Michigan Wine Month Giveaway! Today's Prize: Two winners today! Each will receive a Reserve Wine Flight Package for Two, which includes two flights of five samples of BHV wines, two gourmet snacks and two souvenir logo wine glasses. For fans of large-format wine bottles, it’s definitely the latter. There’s just something about a ginormous bottle of wine that piques even the most casual wine consumer’s interest. And for die-hard wine aficionados, it’s an eye-catching, conversation-starting, envy-provoking addition to their cellars. Check out Cort's latest Michigan wine blog for HourDetroit.com, focused on BIG bottles. Are you of the "go big or go home" variety? This giveaway is closed as of 11:59 p.m. April 16. Stay tuned for the next one! Today's Prize: VIP tour for two, which includes two flights of five samples of Bowers Harbor wines, two gourmet snacks and two souvenir logo wine glasses. Must be scheduled in advance; expires January 2015. Head on over to our Facebook page to enter! The deadline for today’s giveaway is 11:59 p.m. Thursday, April 17. More rhapsodizing over Riesling, more goofy-looking tip-of-tongue sweetness testing in this taste-through of Bowers Harbor Vineyards 2011 Smokey Hollow Riesling. Yes, this podcast is particularly lengthy, but we promise it isn't all a love letter to Cort's favorite grape: Around the 6:10 mark, we delve into how to read a Michigan wine label and how knowing the vineyard the grapes come from adds to your tasting experience. Are you a Bowers Harbor and/or Riesling fan? Come tell us about it.